Based upon Marvel Comics’ most iconic anti-hero, Deadpool is the origin story of former Special Forces operative turned mercenary Wade Wilson (Ryan Reynolds). After nearly being killed in an off-the-books experiment by rogue scientist Ajax (Ed Skrein), Wilson’s left disfigured but gifted with accelerated healing powers. 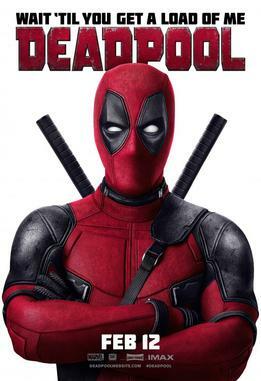 Upon adopting the alter ego Deadpool, the wisecracking “Merc with a Mouth” hunts down the man who destroyed his life. In the most rewarding surprise of the year, the Merc with a Mouth blows expectations out of the water with gratuitous violence, vulgar humor, and bloody satisfaction. Comic book origin stories tend to start slow due to character development, as seen in fellow Marvel movies like Captain America: The First Avenger. Breaking not only the fourth wall, but all the rules, Deadpool cleverly avoids this pitfall by way of nonlinear storytelling, jumping back and forth between past and present events. Ryan Reynolds is no stranger to comedy, considering most of his successful early work was in this very genre, and his timing, crass, and delivery couldn’t be more on point than right here, made all the more riotous when coupled with the hilarious T.J. Miller. Not only is the acting superb, but the writing is gloriously raunchy. This isn’t a soft R-rating by any stretch of the imagination. It knows it’s pushing the boundaries, and plows through them unapologetically. Adding to the first-rate roster is director Tim Miller. Yes, this may be his first full-length feature, but this is no amateur at the helm. With previous visual effects experience on both X-Men and X2: X-Men United and stunning directorial work showcased in David Fincher’s The Girl with the Dragon Tattoo’s title sequence, it’s impossible to deny that the man has raw talent and an eye for stylized imagery. Due to its gratuitous nature, Deadpool may not everyone’s cup of tea, particularly for younger audiences. The film’s numerous trailers give you an accurate idea of just what kind of experience you’re in for. So if you’re one of the many who reveled in the sneak peeks, you’re guaranteed to love this rip-roaring comic book adaptation. In fact, it just might leave you giddy upon exiting the theater. At last, we can wash out the horrible taste from our mouths with FOX’s previous attempt. Deadpool is undeniably the best laugh and action-pleaser seen this year.